Welcome back guys! The warmer weather is here and spring is in our future. This time of year I’m pulling myself out of cabin fever and rushing to get outside to be welcomed by soft wind against my skin and peeping bulbs everywhere. I have to admit, I haven’t tried new recipe’s lately and the one’s I’ve indulged in haven’t quite made it to camera. Go ahead. Call me unreliable. Being stuck in the house with dreary weather has been so uninspiring. Rain rain go away. The addition of B12 deficiency anemia doesn’t help my case either. Well, enough with excuses. I’ll try not to be away so long this time. Some time a few weeks ago I tried this recipe. 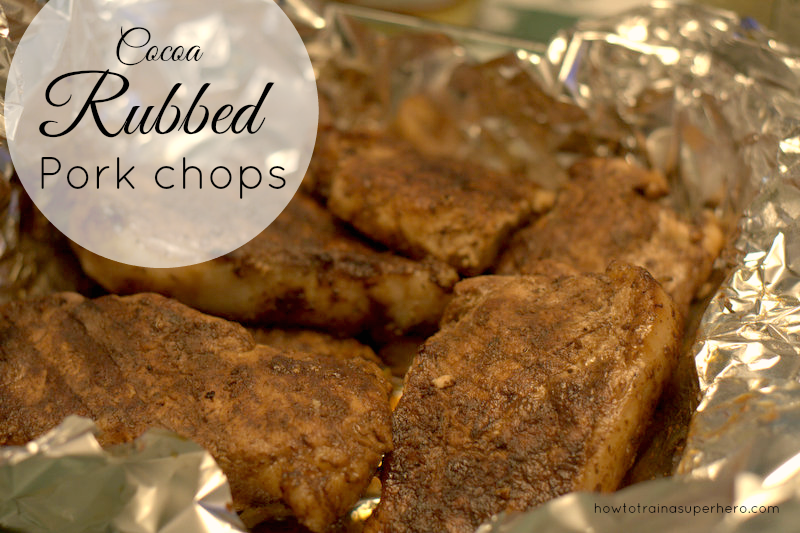 I used boneless pork chops and grilled them. You can hardly taste the cocoa and it adds a nice smokey flavor. I usually don’t try pork recipes very often because they can be overly flavorful, dry, or not flavorful enough. I pretty much stick to a basic lemon garlic baked dish. But oh man did we devour this! They were very juicy (without brine- but I did sit them in the fridge for 30 mins) and moist. I served this with buttered noodles and iceberg/strawberry salad. My hulk smash did complain that they were a bit spicy and I would agree the second day we had them but not too spicy, just a tiny kick. He’s 5 now and he slopped them up anyway. Try them please! I’m getting much better at indoor photography but I’m still working on the lighting situation. Here’s what’s coming up this week on our meal plan. Breakfast: Amish breakfast casserole (my way) Chocolate chip banana muffins and homemade strawberry yogurt Blueberry breakfast biscuits with sausage and honey Cereal (gasp) and leftover muffins Oatmeal and strawberries Dinner: Whole roasted chicken, broccoli casserole, sweet corn spoonbread with homemade muffin mix Zesty Italian Chicken bake Linguine Casserole Angel hair pasta Bbq burgers and dogs, with homemade cole slaw How do you like your pork chops?